The convention season is well underway. Gamescom, in Germany, is the next big convention coming up. It will take place August 16th through the 19th, and the SWTOR team is going to be there. This is not just a token appearance for BioWare. They will have the new Warzone, Ancient Hypergates for convention attendees to try for themselves. According to the news article found on SWTOR’s official site, the new Warzone will be loaded and ready to play on 32 computers for the convention. They also have scheduled an official press conference that says to contain, “some exciting new details about the future of The Old Republic.” The press conference is scheduled for August 14th. The BioWare team is also planning another “Meet & Greet” event to coincide with the convention on Thursday night, August 16th. For more details about attending for our friends in Europe or those traveling to Gamescom please check the link to apply for your invitation. A bit of bad news concerning the convention and event season, SWTOR had originally been scheduled to be a part of Star Wars Celebration. However dues to scheduling with other conventions and working on the game the team sadly cannot make it to this event. You can read the official announcement from Community Manager Joveth Gonzalez below. Folks, I wanted to follow up a bit regarding Celebrations. We do apologize for any inconvenience but our dev team is hard at work on the game, and we just couldn’t spare the staff. We just completed Comic-Con and are preparing to attend Gamescom in Germany next week. Stay tuned for updates about future events. This is disappointing, but unfortunately they cannot be at every event and work on the game. Let’s hope that this is a sign of them making a commitment to focusing on new content of higher quality and getting it out faster. We, the gaming community, tend to complain when we don’t hear any answers to our questions. Allison Berryman did give us some answers about a few areas. Some of which are a bit “disappointing,” to use her word, but we did get answers. It also means they are listening and are working on the new content. Below is Allison Berryman’s post from the dev tracker. I’m afraid my answers here may be a little disappointing, since most of this revolves around questions about the future, but I will answer with the best I can. 1. No information about space right now; apologies! 2. Nightmare Explosive Conflict has not been scrapped. Still in the works! 3. Don’t have any information about open world PvP at the moment. 4. 1.4 is coming along quite well. While your class feedback has been compiled and sent up, not every class change you see in 1.4 will necessarily be based on it, but we did appreciate the very constructive feedback we got. Okay so now some of you might be down, so let’s get some smiles back. Nothing better than a fun SWTOR music video to cure having the blues…hmm unless you happen to like ponies and unicorns, oh wait, this has those in it too. It is a fun and yes, very silly video, but isn’t this all about having fun? Check Youtube user Boski Fox’s video, a SWTOR Pony Dance Off! Another exciting week here at CRR, Ghoztt starting his stat theorycrafting, Maer talks about her thoughts on the Free-to-Play option, another podcast – Episode #67 & Geldarion shows us some video of his PVP gameplay. We hope you check out all the past week’s articles. Please be sure to leave a comment on our staff’s articles. We really love your feedback and discussions. Let us know what you would like to see on the site. The director of Fanboys, Kyle Newman is supposedly working on a scripting for a movie named Chewie. 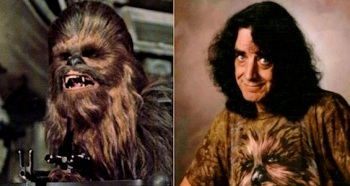 It is not exactly stated how the director plans to take this movie, but how he treated Fanboys it might be a well deserved backstory on the man behind the fur, Peter Mayhew. It will be interesting to see what becomes of this project. Please be sure to check out the article from Screenrant. Would you like to see a Star Wars movie based on Chewbacca or maybe another character? Please let us know in the comment section below. Are these the Sith Cookies everyone talks about? In a blog from called Moogie & Pap, I came across this cookie recipe. Ever since I had been nudged and recruited to join the Empire. *cough Carla* I had heard about some alleged Sith/Empire cookies. Well, I think I have found them. The author has used a sugar cookie recipe, which is shown below. The real kicker that makes these a “Dark Side” treats is the unique way they added chocolate to their cookies. It is not a frosting or even a glaze of chocolate. Each cookie has a piece of chocolate that has setup in an ice cube tray found at ThinkGeek.com, of Han Solo as he appeared frozen in Carbonite. 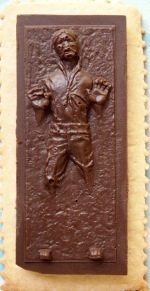 So not only are you reenacting freezing Han several times over, but after heating the bottom of each chocolate Carbonite form so they will adhere to the cookies…you then devour Han, possibly even after dunking the Carbonite frozen man in a glass of milk over and over….hmm evil sounding, but I bet they taste good. For rest of the directions please see the blog post.